Groove Phi Groove Social Fellowship, Inc. was founded at Morgan State College (now Morgan State University) on October 12, 1962 by fourteen daring, young, black American men who wanted to change the way we think about brotherhood. 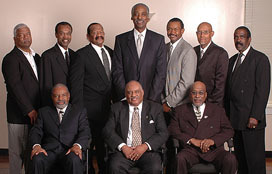 Our founders established the Fellowship with the purposes of promoting academic awareness, ethical standards, and unity among men in undergraduate and graduate college programs; creating intelligent and effective leadership; and studying and helping to alleviate the social and economic problems of society to generally improve the world. Little did our founders know in 1962 that the fruits of their efforts at Morgan State College would evolve into a thriving movement that continues to play an important role in developing and nurturing what we know as Black America. The Fellowship currently has thousands of members and dozens of graduate and undergraduate chapters across the United States. Our members work in a wide variety of career areas, including accounting, education, engineering, human resource services, local and state government, medicine, law, protective services, information technology, religion, real estate, food service, skilled crafts, music, professional sports, the armed services, and business. In support of its purposes, the Fellowship’s affiliate chapters and members are encouraged to actively support the programs identified in our National Community Service Manual and the Groove Fund, Inc., the charitable arm of Groove Phi Groove. During the 1960s, the word “GROOVE” was popular among a generation of young blacks. Webster’s Dictionary defines the verb “groove” as “to perform deftly or smoothly.” As a noun, “groove” is defined as a “fixed routine in the affairs of life.” Hence, to go against the “groove” means to work against the current establishment, and “grooving” is associated with “socializing or fellowshipping.” These combined definitions form the essence of Groove Phi Groove Social Fellowship, Inc. In “Secrets of the Great Pyramids” by Pete Thompkins, the Khemit people of ancient Egypt created “phi” as a symbol of the creative function of the male reproductive system and, more loosely, as “reproduction in endless series,” which is a symbolic representation of “the fire of life.” Our Fellowship has incorporated this symbol of fertility into its name to stand for our continual growth and development. Our “phi” symbol should not be confused with the Greek one. They look the same but have very different meanings.